Bring a non-KC Cheer friend for only an additional $15! Have your friend put your name in the comments section of the enrollment page so that they will receive the discount. Order your candy filled eggs to be hidden in your yard before 6 a.m. Easter morning! Let our “bunnies” do all the work with proceeds benefiting Fame on their way to the Summit in Orlando. Payment accepted via cash or PayPal to gmbrick@sbcglobal.net. Please include your name, order total, address, phone number and when paying through PayPal. Help Support KC Cheer FIESTA in their Climb to the Summit! Fiesta athletes are currently selling $10 raffle tickets for a chance to win a gift card basket (up to a $275 value). All money must be turned in by March 26th. Winner will be drawn March 31st at 6:00pm. Ticket Sales are goin on now, so contact your favorite Fiesta athlete to purchase your tickets! See the flyer for participating gift card locations. Come EAT, Have FUN and Support KC Cheer Flash! Tuesday, March 26, 5-8 p.m. at the Olathe Chick Fil A location at 12087 S. Blackbob Road. Tell the cashier at checkout that you are here to support KC Cheer Flash and a portion of your sale will be donated back to the team! KC Cheer is proud to partner with St. Jude Children’s Research Hospital for our first Flip-A-Thon event! Athletes will work to complete as many flips as possible during the one hour event to raise money for Worlds and Summit travel expenses, as well as next year’s new uniforms. 20% of all pledges will be donated to St. Jude. We challenge athletes to complete as many flips as possible! Even if you can’t participate in the event, please seek donations as a contribution to your team and for St. Jude. Pledge money is due April 15th and checks can be made payable to KC Cheer Booster Club. Flip-A-Thon will take place at KC Cheer on Sunday, April 7 from 11:30 a.m. to 12:30 p.m.
Click here for Pledge Form! REGISTER BY APRIL 4TH (DATE HAS BEEN EXTENDED) TO RECEIVE A BE FEARLESS TANK TOP! Leave your tank top size in the comments section of the registration form. Click here to register! Join us for a fundraiser to support Flawless on their trip to the Summit! Head to Evereve at Town Center (4319 W. 119th St., Leawood, KS) to enjoy complimentary wine, mocktails and snacks while you shop for a good cause. Shop the winter sale and get ready for Spring Break! 15% of all sales will support the KC Cheer Booster Club/Flawless Summit Fund. Thursday, February 21, 2019 between 6:00p.m. and 8:00p.m. Join us for a fundraiser to support KC Cheer! Trash bag fundraiser starts on July 1! 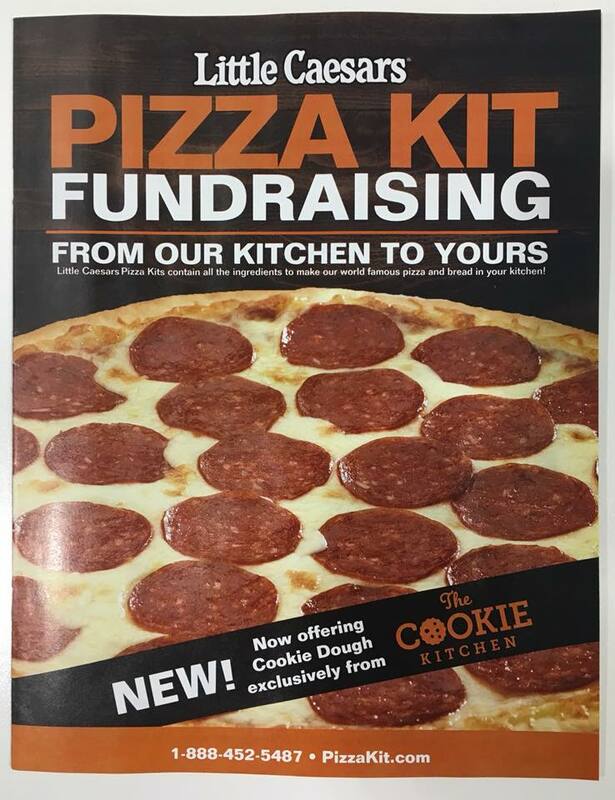 Team members can pick up Little Ceasar's Pizza Fundraising forms at the gym all week. Orders are due on April 9! You'll sell brackets for $20 each for the basketball tournament. Once you sell a bracket, you'll write down the name and email address of the buyer so we can send them the password needed to fill out the brackets. You'll send a full list of your brackets sold to anne_epperson@swissre.com no later than March 11 at 5:00 p.m.
Do not send multiple emails with a few names here and there. Wait until you have your final list and send ONE email with all names. Money will also be due to Anne at this time. Once Anne has received your money and you have sent in your list, we will send a password to register for the contest to every email on the list. Participants will be able to register using the password at www.pickhoops.com/KCCHEER. Athletes must turn in money collected and participant names and email addresses no later than March 11 at 5:00 p.m. Money can be turned in via Venmo to @anneepperson , cash in an envelope with athlete's name on it turned into Booster Club mailbox, or check made out to Anne Epperson into the Booster Club mailbox. Absolutely no late entries will be accepted, as the website will automatically close at 11:18 on March 16. If you paid and forget to fill out your bracket by this deadline, we will not be able to refund your entry money. Cash prizes will be awarded to the top 5 scoring brackets. 1st place will win 50% of the pot, 2nd place will win 20%, 3rd will win 15%, 4th will win 10% and 5th will win 5%. Dollar amounts will be based on the size of the pot. The Booster Club will be selling Yearbooks again for the 2017-2018 season. These hardcover, full-color books are incredible keepsakes for your cheerleader to enjoy for years to come. Bring your payment to the gym no later than November 15. Checks are to be made out to KC Cheer Booster Club and either delivered to a board member or left in the Booster Club Box in the arena. Please note: TABLES ARE NOT PROVIDED! This event will be held rain or shine! We do not offer refunds. Product categories must be itemized on your application. Vendors may not sell food or beverage items without permission from the KC Cheer Booster Club. Trash must be removed from your space when you leave the event. Please do not set-up until your vehicle is fully unloaded and moved to the designated parking area. Food vendors will be stationed outside the gym. All work and displays must stay within designated spot. No boxes, extra merchandise or debris should be visible. Assigned area must be kept clean throughout the event and be left spotless afterwards. Not all spaces are guaranteed electricity. Registration is not complete without payment and signed contract. All applications will be reviewed by the KC Cheer Booster Club on an individual basis. Not all applications will be accepted. If you are interested, please submit your application by filling out the form below or placing your application in the booster club mailbox at either gym no later than October 23. The booster club will notify you of approval no later than October 26. If you are approved, please submit your $75 non-refundable fee NO LATER THAN November 1st in order to confirm your spot. You can also print a PDF of the Vendor Form and turn it in to the Booster Club Box at the Gym. The KC Cheer Booster Club gift card fundraiser is a great way to make money for your Booster Club account. We collect donations of $25 gift cards to put into a "basket" to raffle off at the Gym Picnic. In past years, raffle baskets have valued at more than $1,250! Purchase a $25 gift card from a national merchant to donate to the gift card basket. Your donation will earn you 10 raffle tickets to sell for $10 each. This money will go directly into your booster club account. Every time you sell 10 tickets, you can deposit your money and receive 10 more tickets. You can continue to turn in your money and receive tickets until the Gym Picnic on September 17. The Booster Club will raffle off the final group of gift cards at the event. All funds from raffle ticket sales will go directly into your personal Booster Club account. A donation of a gift card valued at $25 or more is required to participate in raffle ticket sales. Drop off dates are July 1, August 1, 2, and 3 from 5:00-7:30 p.m. Bring your donation to the arena to deliver to a board member. The Booster Club Board will release the monetary value of the final prize after all gift cards have been collected. This number will be finalized by August 7 and relayed by your team parents. Envelopes must be delivered to the gym during the second ticket pickup date, which is September 5, 6 and 7 from 5:00-7:30 p.m. These envelopes may be delivered to a Booster Club board member in the arena or dropped off in the Booster Club mailbox in the main gym. All tickets and money must be turned in to the Booster Club by September 7 at 7:30 p.m.
Raffle winners will be announced at the Gym Picnic on September 17.